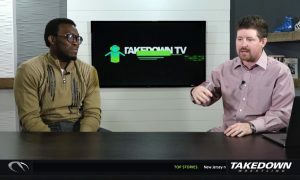 Saturday, Takedown Radio had one of its most special episodes of the year, the NCAA Championship Special. Six of the ten 2019 NCAA Champions called in to speak with Steve Foster, Michael Harvey and crew. 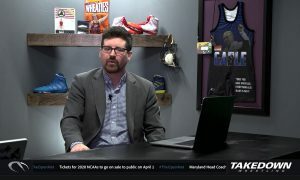 Because of the occasion, there were even two former NCAA Champions that sat in with the Takedown crew to participate in the interviews Iowa State’s Nate Gallick and David Zabriskie. Here are some of the highlights from the show. 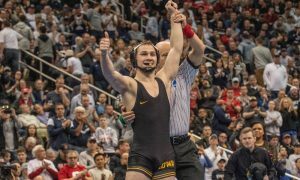 Just like in most dual meets, the gang started with 125 lber Spencer Lee (Iowa). Spencer ran through the field at the NCAA Championships to capture his second NCAA title in as many years. After suffering three losses throughout the course of the season, there were plenty of people who doubted the Hawkeye. Spencer credits the coaching staff for making sure “We always wrestle our best, when it counts, in March”. Even though the “college season is always a long season” he never got down and kept his eyes focused on the prize. 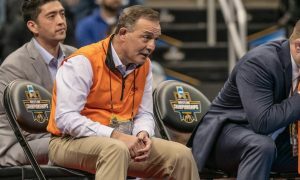 Perhaps the most surprising loss of the season for Lee came when he was pinned in Gallagher-Iba Arena by Nick Piccininni. What happened afterwards exemplifies the brotherhood that he shares with his fellow Iowa wrestlers. “Every single person on the team came up and told me they loved me. After a tough loss like that it was something that will resonate with me for the rest of my life”. 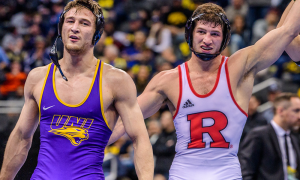 Spencer would close by talking about his relationship with 133 lb All-American Austin DeSanto and the growth Austin has made during his time in Iowa City. He also credits DeSanto for picking him up after the loss to Piccininni, when he himself suffered a tough setback, and made sure he was focused on the proper goals. History was made after the 133 lb NCAA final when Nick Suriano (Rutgers) became the first national champion in school history. Two matches later, his teammate Anthony Ashnault became the second. Suriano believes that this is the beginning of a new era for Rutgers wrestling. “We’re getting out of state recruits, building new facilities, we’re building a powerhouse”. 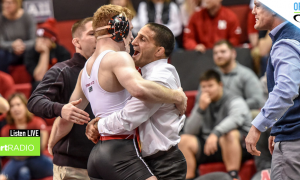 Though he initially went to Penn State, Suriano transferred to Rutgers in 2017-18 and heard the whispers that “you can’t go there and win”, but as he sat back and evaluated the situation, he realized he “can do everything I wanted at home, in Jersey”. Nick will be back in 2019-20 to defend his title and credits his success to “a lot of relentless hard work and calling out the best guys in the room every day”. Admittedly he is so focused on his goals and winning a national title that he has “based his life around his training and it’s hard to keep balance”, though he credits his family and girlfriend with helping him try to maintain that balance. It was another year and another title for Yianni Diakomihalis (Cornell) at 141 lbs. 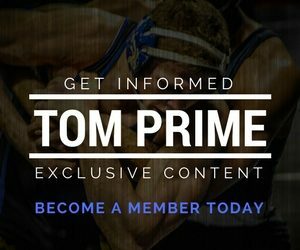 Yianni was able to break down the two controversial sequences during his NCAA final with Joey McKenna (Ohio State) and his thought process during the reviews. 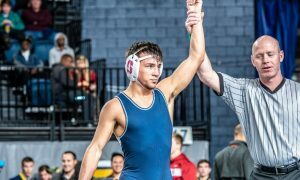 Yianni got a late start to the season due to a knee injury suffered at the 2018 NCAA Championships. While some athletes are tentative post major knee surgery, Yianni said his coaches and trainor had to “slow me down a bit”, as he was trying to do too much, too fast. He also mentions his relationship with Jordan Oliver who he credits for working with him and helping him develop, while knowing in the back of his mind that the two will eventually have to meet up to make a world or Olympic team. That may come sooner than later. Though the 19 year old Diakomihalis still has Junior eligibility, he will be entering the US Open later this month at the Senior level. At this point in time, no decisions have been made regarding Yianni taking an Olympic redshirt. He will need to sit down with his coaches and “figure out if they think I should take one”. His performance this spring will also undoubtedly factor into their decision. 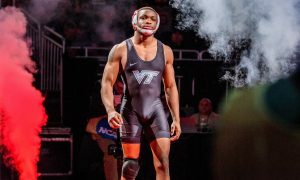 We move from a freshman champion in 2018 to the only one in 2019 in Mekhi Lewis (Virginia Tech). Mekhi and the crew went all the back to his beginning in the sport as a five-year-old in New Jersey who expected the sport to consist of powerbombs and choke slams and needed timeouts because he wasn’t taking the practices seriously. Fast forward a few years and on the verge of his first NCAA Tournament, Lewis had his coaches in his ear telling him “Why can’t it be you”, referring to the freshman winning it all. Mekhi got deep into his mindset throughout the tournament when he didn’t “worry about all the big guys in my bracket and focused on myself” and walked around with headphones on to lessen the noise of the excited crowds. 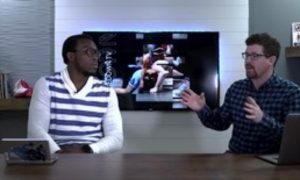 He also recalled his past battles with the “Bull” Alex Marinelli (Iowa) and what he learned from that match and how it helped prepare him for the NCAA quarterfinals. 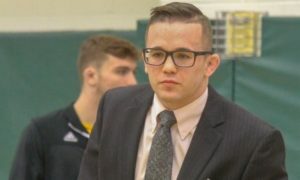 The crew then moved onto Drew Foster (Northern Iowa), the Iowa boy that brought back an NCAA title to Cedar Falls for the first time since 2000. There has been a renewed excitement surrounding the program since the arrival of Doug Schwab and Foster thinks that the “Panther Train” is more of a family atmosphere than anywhere else. One of his favorite quotes from Schwab is to “not be scared to tell the people that you love, you love them”. When Steve and the gang mention a regular season dual meet with Iowa State, it sparks Drew to get into the tradition of West Gym, a place that gets “too hot and rowdy” but also serves as a great home mat advantage. Foster finishes by expounding on his relationship with Northern Iowa assistant coach Randy Pugh. “He believed in me and believed in me before I truly belived in myself”. Pugh was instrumental in recruiting Foster, a four-sport athlete in high school, despite never having won an Iowa state title. The show closer is new two-time NCAA Champion Zahid Valencia (Arizona State). Zahid was open about his two regular season losses to Daniel Lewis (Missouri) and Mark Hall (Penn State) and how gratifying it felt to defeat those two in the NCAA semis, then finals. “The second (Hall) had a little more meaning because of the two losses”. Hall had dominated Valencia in their early season dual meet and won a controversial match over Zahid in the 2017 NCAA semis. Zahid was not shy about discussing his future plans either. He is excited about the prospect of competing against our national team at “Beat the Streets” and in international tournaments. He downplayed the idea of taking an Olympic redshirt in 2019-20, stating that he has already taken one and would prefer to finish next year.